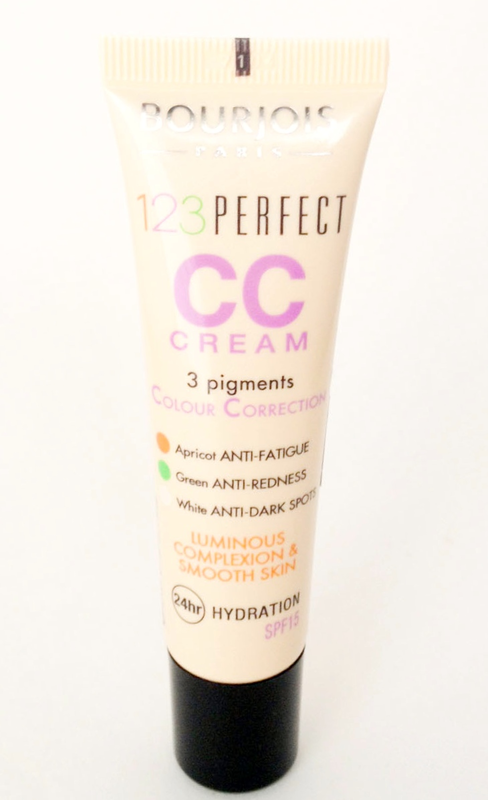 Musing On Beauty: The new Bourjois 123 Perfect CC Cream. Yet another CC cream launched on the market, this time in the drugstore, and we all know that I generally dislike them. But when it's Lisa Eldridge who uses it and it looks so good, I just can't resist and so I needed to try it. So I went to the drugstore and purchased this in the lightest shade, #31, for €9.50. I was very surprised, having experience so many thick and hard to blend BB/CC creams, to find out that this one was quite the opposite: it's very liquid and so easy to spread and blend. Another positive surprise was to see that the color matched me perfectly, because usually, the palest colors in bases have the wrong undertone for me. This one is just neutral/yellow and pale enough for me. And the third positive surprise, coming from a Bourjois product: no smell. Or hardly any, at least I didn't notice anything. Now in terms of wear, this will give you a sheer coverage with a satin finish. Your skin will look smooth, like blurred, but not flat at all. It's also not too luminous, and I didn't feel the need to powder at all after applying, the glow was just lovely. However, even with pretty good skin (I had a really good skin day when I took that picture), you won't cover everything with this product. Concealer under the eyes and around the nose still necessary for me. I am pretty happy with the final result and how this looks on my face. I do have to say that this isn't the most long lasting base I've tried, though. After a few hours of wear, I did feel the need to add a bit of powder on the T-zone as the product was starting to move around a bit. But in all honesty, Nars Radiant Moisturiser does the same on me and it costs three times the price. Great product, especially for the price. If you're not super oily and are looking for a sheer base that gives you a healthy look, definitely go for it! There are 4 shades available, and a matching concealer that I haven't tried. This is already available in Belgium, France and UK, as well as on ASOS for international customers.